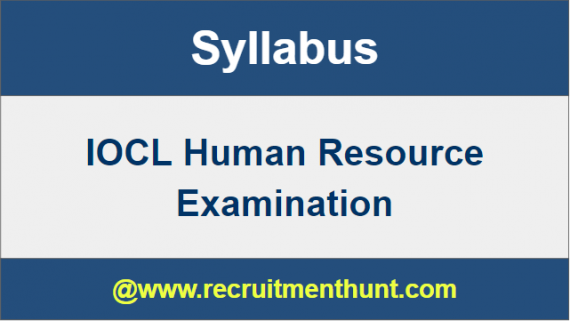 IOCL Human Resource Syllabus: Here, we upload the IOCL Human Resource Officer Syllabus and IOCL Human Resource Officer Exam Pattern 2019. It is a good opportunity for the candidates who want to get placed in IOCL Organisation. Aspirants also check IOCL Human Resource Officer Previous Papers with solutions here. Get complete details of IOCL Human Officer Recruitment 2019 like Exam Date, Job location, Payscale, Exam mode, Selection Process, etc. By visiting our site contenders can also check and log on to IOCL Official website i.e, www.iocl.com through this page. Indian Oil Corporation Limited (IOCL) has released a notification for the recruitment of 221 Human Resource Officers, Quality Control Officers and More. Interested candidates may check the eligibility criteria and apply online from the IOCL application Release Date. For More Details About IOCL Human Resource Recruitment, IOCL Human Resource Previous Year Question paper, IOCL Human Resource Admit Card and IOCL Human Resource result you can log on to our site i.e, www.recruitmenthunt.com. Its good news for the candidates who are waiting for Indian Oil Corporation Limited Recruitment 2019. After completion of filling applications candidates need to start their preparation to achieve a job in IOCL Organisation. Officials of IOCL Organisation select talented and skilled persons in their selection process. IOCL Organisation is going to conduct a Written Exam and Personal interview to recruit persons for IOCL Human Resource Officer Post 2019. For the sake of aspirants, we upload the latest IOCL Human Resource Officer Syllabus and IOCL HR Officer Exam Pattern 2018-19 on this page. Also, aspirants can download IOCL Human Resource Officer Previous Papers here. Contenders who are waiting for IOCL Careers have to use this opportunity to settle down in Indian Oil Corporation Limited Organisation. By following IOCL Human Resource Officer Syllabus applicants can make their preparation easy. And also by aanalyzingIOCL Human Resource Officer Exam Pattern and IOCL Human Resource Officer Syllabus, you can get an idea of how to prepare for IOCL Human Resource Officer Exam 2019. During preparation, Candidates have to select easy topics in IOCL Human Resource Officer Syllabus to prepare and while writing IOCL Human Resource Officer Exam you applicants have to answer easy questions to score more marks. Also, Get IOCL Human Resource Officer Previous Year Question Papers along with Answers here. IOCL Human Resource Officer Exam Consists of Objective Type Test. IOCL Human Resource Consists of Part A and Part B. In IOCL Human Resource Officer Part A consists of 85 Marks and Part B consists of 85 marks, Overall Exam consists of 170 marks. In the below section we gave subject wise IOCL Human Resource Officer syllabus in PDF Format. so, candidates can easily check topic wise Syllabus to prepare for IOCL Human Resource officer Exam 2019. Therefore, we gave topic wise detailed IOCL Human Resource Officer Syllabus in PDF format. Also, candidates can check IOCL Human Resource Officer Exam Pattern 2018-19. Get IOCL Human Resource Officer Previous papers with solutions on the above link. Finally, candidates can download IOCL Human Resource Officer Previous Year Question Papers, Notification & Exam Pattern here. Applicants can make their preparation easier by following IOCL Human Resource Syllabus. Download IOCL Human Resource Exam Pattern along with IOCL Human Resource Previous Year Question Papers through this article. Also, for more job updates subscribe and stay tuned to our website RecruitmentHunt..